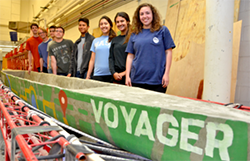 LAWRENCE — The concrete canoe team at the University of Kansas School of Engineering is making its final preparations for the annual Concrete Canoe Competition, sponsored by the American Society of Civil Engineers (ASCE) and hosted this year at the University of Arkansas on April 21-22. The competition has several components: Teams must build the canoes — KU has been at work on design and construction since this year’s rules were released in the fall — and make a presentation about the project. Then, the moment of truth: Students have to prove the boats actually work. Multer said competition organizers had changed this year’s rules to limit the amount of certain types of aggregates used by many teams in previous years. At least one major rule changes every year so that winning teams can’t rest on their laurels; everybody must go back to the drawing board and start from scratch. "We spent the majority of our hours in the fall testing new aggregates,” Multer said. The students spent months designing their canoe in the fall — KU’s entry is named “Voyager” — and building it, sanding it and patching it in the spring. Team members have also been practicing their paddling skills, because the last part of the competition involves more muscle work than design skill. "We will actually get in the canoe and race it,” Multer said. There are actually multiple races: A 600-meter endurance course, as well as 200-meter and 400-meter sprints. Multer said KU’s team has been using regular canoes as well as last year’s competition canoe in its practices. This year’s canoe won’t hit the water until the competition itself. The competition allows KU engineering students to put their classroom lessons to work in an applied setting. "I have a lot of fun,” Multer said. “From a technical aspect, it's a lot of fun to see everything you're learning in class be applicable, working it and applying in real life." The April competition will pit KU against teams from universities across Kansas, Missouri, Nebraska, Oklahoma and Illinois. Winners will move on to the national competition June 17-19 at the Colorado School of Mines in Golden, Colorado.